MORAL-ETHICAL EMPHASIS — Respect; Citizenship. Drama; 94 minutes; 2007; Color. Available from Amazon.com. Today, most people view the disabled as full-fledged citizens who have the right to participate in mainstream society as much as they can. There is a law, the Americans With Disabilities Act of 1990 (“the ADA”), which requires that facilities open to the public be built or modified to provide access for disabled people and that they be given reasonable accommodations so that they can hold down a job. Before that time there were no such obligations. The movement to grant the disabled access to buildings otherwise open to the public and to integrate them into the work-life of the community was one of the five movements that made substantial advances in human rights in the United States during the 20th century. The other four were: (1) suffrage and civil rights for women; (2) civil rights for blacks and other minorities; (3) procedural rights for persons accused of crimes; and (4) ending discrimination against homosexuals. All of these movements are works in progress. The crown jewel of the effort to extend equal rights to homosexuals, gay marriage, was won only in 2015 with the decision of the Supreme Court in the case of Obergefell v. Hodges. One of the Best! This movie is on TWM’s short list of the best movies to supplement Health Classes, High School Level. Teachers can modify the movie worksheets to fit the needs of each class. See also TWM’s Historical Fiction in Film Cross-Curricular Homework Project and Movies as Literature Homework Project. This film is a biography of Richard Pimentel (1947 – ), one of the people most responsible for the movement to recognize the disabled as full-fledged human beings. His advocacy was a major factor in passage of the ADA. As the movie opens, the audience sees Richard’s rocky childhood: his mother is haunted by three miscarriages and is in and out of mental hospitals. Richard’s father dies when he is a young boy. When his application for a scholarship to attend college is rejected, Richard enlists in the army and is sent to Vietnam. A mortar attack leaves him with severe tinnitus, which effectively deafens him. After he enrolls in Portland State University on the GI Bill, Richard meets the brilliant and witty Art, who is confined to a wheelchair with cerebral palsy. The two become close friends, and Richard is appalled by the discrimination that Art faces on a daily basis. Richard also meets Mike, a disabled vet with PTSD, who can’t find a place in peacetime society or relief from the survivor’s guilt that he feels because his best friend didn’t survive. Angry at society’s hostility to injured Vietnam veterans, as well as its mistreatment of handicapped civilians, Richard Pimentel finds his life’s purpose in advocating for the disabled. Actually, he becomes obsessed with his mission . . . and there are costs. Mike is unable to fight off his demons and commits suicide. Richard wonders whether Mike would have survived had Richard not been off on a speaking gig. Richard’s girlfriend, Christine, feels neglected because of Richard’s focus on his quest. Eventually, she leaves him. Richard Pimentel served as a consultant for the film. It portrays, with reasonable accuracy, the many important events of Mr. Pimentel’s story. The film’s great pop music score and visuals bring the 1960s and 1970s into vivid relief. Most students are unaware of the prejudice against disabled people that existed in the U.S. in the 19th and 20th centuries. There were actually “ugly laws” which made it illegal for “deformed” people to appear in public. Americans seeking better treatment for the disabled eventually convinced local governments to repeal the ugly laws and persuaded Congress to outlaw discrimination against the handicapped in education, employment, and physical access (the ADA). These changes in the law depended on changing the way society views disabled people. Students will absorb these developments as they follow the progress of Richard’s friendships with Art and Mike. This film also presents an example of a person who had a difficult start in life and who wrestled with its effects even as he built a meaningful career. Students who have suffered early-life trauma or who are from a dysfunctional family can come to understand the connections between their personal histories and their current challenges. Perhaps they will be motivated to seek help. Social Studies: This film presents one of the five great advances in human rights in the U.S. during the 20th century: the movement to allow the disabled to integrate into mainstream society. It will show students that just a few years ago, disabled people could not get access to public buildings and could be discriminated against at work and in education. The movie also provides a window onto life in the last half of the 20th century. Health: Students love the character of Art, a man confined to a wheelchair by cerebral palsy. Art’s spastic movements make even the simplest tasks of daily life extremely difficult. Michael Sheen’s portrayal of this real-life character is so engaging that students’ view of persons with obvious physical disabilities will change forever. The movie will also help students reach new levels of understanding about the effects of early childhood trauma, PTSD, and overcoming a dysfunctional family. 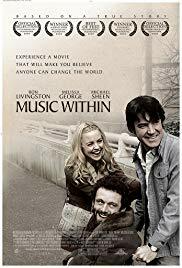 Music Within is one of the best films for Health classes relating to disabilities. English Language Arts: The movie is an excellent description of the human condition as lived in America during the 20th century. It vicariously expands students’ experiences and raises important questions that are great topics for persuasive essays and other writing projects. People who saw Art rolling down the street and into stores in his wheel-chair often remarked on his courage. When told of this, Art laughed and said, “I’m not that courageous, I do what I do because I’m afraid to not do what I do. That’s not courage.” Art Honeyman Hits the Streets from OregonLive.com, published 7/7/07 and revised 12/9/08 by Inara Verzemnieks. In 2008 at the age of 68, Art Honeyman died having led a full and eventful life. MODERATE. Music Within is rated R for language, with some sexual references, and for some drug content. There is isolated garden variety profanity; words used or heard by most middle and high school students. Richard and his girlfriend are shown making love, but there is nothing graphic about the scenes. Vietnam veterans are shown smoking marijuana and drinking during a group meeting. The scenes are realistic, and the drug use is not shown in a positive light. There is virtually no interpersonal violence. TWM is reluctant to recommend movies with R ratings but in this case, the R rating is misapplied, and the value of the film far outweighs any problems caused by these scenes. Watch the film with your children and afterward briefly describe to them the five great advances in human rights that occurred in the U.S. during the 20th century. Then ask and answer the Quick Discussion Question. An introduction is necessary for students to fully appreciate the movie. The information below should be delivered through direct instruction or by having students read it as a handout. Click here for a word processing version of the handout. Edit, supplement or subtract from these materials as appropriate for the classes to which they will be given. Most of the events shown in this film actually occurred. 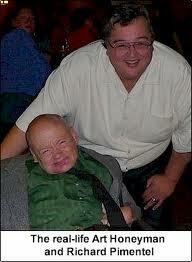 Richard Pimentel is one of the people responsible for the passage of the Americans With Disabilities Act in 1990. That law requires restaurants and public facilities to install wheelchair ramps or elevators and requires that the disabled be given reasonable accommodations in employment. The characters of Art and Christine are also based on real people. Up to 1974, less than 40 years ago, people could be arrested just for being ugly in public. “Ugly Laws” were enacted in western and mid-western U.S. cities as part of urban reform movements in the late 1800s. They were designed to regulate and sanitize rapidly growing cities by keeping them clear of beggars, some of whom were able-bodied hustlers pretending to be injured or handicapped. The laws were originally intended to get the physically deformed and mentally impaired into the minimally charitable almshouses, end begging by the non-impaired, and placate merchants. Later, classism and racism combined with the feelings of unease in the presence of the disabled to create individual and institutional prejudice against the handicapped. The first ugly law was enacted in San Francisco in 1867. Similar statutes were eventually enacted in other states and then in other countries. The last Ugly Law in the U.S. was repealed in 1974 in Chicago. The Ugly Laws — Disability in Public by Susan M. Schweik, New York University Press, 2009. Several characters in the film are veterans of the Vietnam War, a war which became very unpopular in the United States. Many people did not welcome soldiers who came home from the war, believing that vets supported the war. Civilians often feared Vietnam vets because they used drugs and suffered from Post Traumatic Stress Disorder (“PTSD”). PTSD is an anxiety disorder that many people experience after living through a dangerous or frightening event. For example, soldiers, plane crash survivors, and eyewitnesses to shooting rampages can suffer from PTSD. Nightmares, flashbacks, outbursts of anger, depression, and suicidal thoughts are some of the symptoms of PTSD. Post-Traumatic Stress Disorder (PTSD) from the National Institute of Mental Health; downloaded February 26, 2011. Several of the vets shown in this movie suffers from this condition. One of the characters in the movie suffers from what is called “early childhood trauma.” Recent research findings show that overwhelming adverse experiences early in life such as the loss of one or both parents, or living with an emotionally disturbed or alcoholic parent, may alter the chemical wiring of the developing brain. This is sometimes called early-life trauma, although the trauma referred to is not the extreme violence or risk of injury or death involved in PTSD. Early-life trauma can result in psychological problems later in life, as well as physiological and physical illness such as chronic fatigue syndrome. A 2010 study in collaboration with Emory University concluded that “There is ample evidence . . . that adverse experience early in life, during periods of heightened brain plasticity, permanently programs the development of multiple brain circuits involved in the processing of environmental stimuli and the regulation of behavioral, autonomic, and endocrine responses to stress.” Association of childhood trauma with cognitive function in healthy adults: a pilot study by Matthias Majer, et al, 2010, published by BioMed Central. New treatments, some using drugs and some using psychological therapy, have been developed to treat the effects of early childhood trauma. A study published in the Journal of Traumatic Stress in 2010 cited trauma in childhood as a risk factor for obesity in adulthood. Almost 80 percent of the women in the study had PTSD, depression, or both. The women who reported abuse were more likely to experience PTSD and depression and were also more likely to be overweight in adulthood. Trauma in Childhood Could Contribute to Obesity in Adults in NewsWise, accessed February 27, 2010. Finally, another effect of early childhood trauma is increased susceptibility to PTSD later in life. Cerebral palsy (“CP”) is a medical condition suffered by one of the characters in the movie. It is defined as “[A] disorder of movement, muscle tone or posture that is caused by injury or abnormal development in the immature brain, most often before birth.” Mayo Clinic Website. CP is neither progressive nor contagious. Finally, one of the characters suffers from tinnitus, a ringing, whistling, or whooshing sound inside the ear or head without a corresponding external sound stimulus. The Mayo Clinic’s web page states, “tinnitus affects about 1 in 5 people. Tinnitus isn’t a condition itself — it’s a symptom of an underlying condition, such as a traumatic injury to the inner ear, age-related hearing loss, ear injury or a circulatory system disorder.” Moderate to high-level in-ear headphones, heavily amplified music and noisy industrial environments can also cause both tinnitus and hearing loss. Like many disorders, the syndrome occurs along a continuum. Some people are severely disabled by persistent, invasive ringing. Others notice it only when they read or think about it. Mayo Clinic Website Article on Tinnitus accessed February 27, 2010. 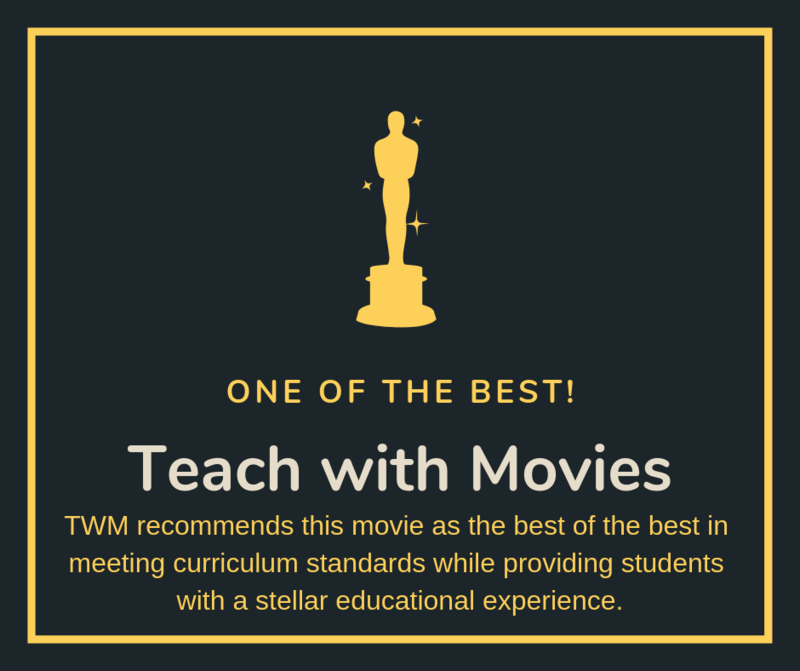 Before starting the film, hand out TWM’s Film Study Worksheet for Social Studies Classes adapted specifically for this film and have the students read it before they see the movie. Be sure to remind them to listen to the lyrics of the songs on the soundtrack. In this movie, the lyrics often match or comment on what is occurring in the film. Show the movie. Stop two or three times during the film to allow students five minutes to review the Film Study Worksheet and make notes as to their responses. One of these pauses should be after the death of Richard’s father. Ask the class a prediction question: “Will Richard’s early life experiences affect his adult life? How?” Allow a short discussion of this question. After the class has finished watching the movie, give them the information set out below about Richard Pimentel. Richard was pronounced dead after birth. His mother had three miscarriages from which she never recovered psychologically. She held birthday parties on the anniversaries of each miscarriage and left Richard in an orphanage. After his dad died, Richard was raised by his grandmother. He didn’t speak until age six. He was labeled “retarded” in school. The strip bar was located in his dad’s old workplace. Richard lived and slept in a dressing room there when he had no other place to stay. Richard’s encounters with Dr. Ben Padrow, who created the College Bowl TV quiz show, were true, as was his deployment to Vietnam and the resulting injury to his ears, causing tinnitus and hearing loss. Richard found his purpose in life in helping the disabled get jobs and be accepted in society. Art had cerebral palsy and, in real life, was as witty and profane as he is made out to be in the movie. He and Richard became life-long friends. Richard and Art were arrested for being “unsightly” in public when they went to a restaurant featuring pancakes at 3:00 A.M. The waitress called Art “the ugliest, most disgusting thing” she had ever seen. They were arrested under a municipal “Ugly Law” Dr. Richard Pimentel, Keynote, Corporate and Motivational Speaker, Comedian, Author from Milt, Wright and Associates, Inc., accessed February 27, 2011. This incident propelled Richard and Art into the activities that culminated in the Americans with Disabilities Act. Law professor Robert Burgdorf Jr. wrote the first draft of the Act in 1987. President George H. W. Bush signed the bill into law in 1990. Richard’s “Tilting at Windmills” employer training program transformed the American workplace. Richard acknowledges that the loss of his mother’s attention and caring due to her mental illness had had a major effect on his personal life as an adult. 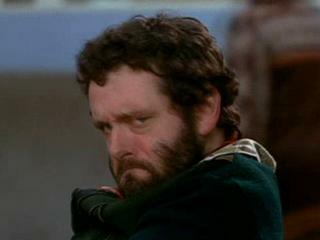 As Richard’s character says in the film, he went into career overdrive to gain his mother’s approval and affection, something she was incapable of giving. His father’s premature death added to Richard’s early emotional void. Richard’s love affair with Christine was brought down by his obsessive devotion to his work. The film’s director Steven Sawelich said, “He abandoned Christine much like his mother abandoned him when he was younger. Richard set a path to prove to himself and his mother that he was good enough to live. For Richard, Christine was another accomplishment in his quest for self-righteousness. ” John P. Meyer’s interview with director Steven Sawalich. Have the class respond in writing or orally to the questions on TWM’s Film Study Worksheet for Social Studies Classes adapted specifically for Music Within. Click here for suggested responses. For assignments and writing projects, see Assignments, Projects and Other Activities. One of the most remarkable things about the United States in the 20th century, one of the things about which citizens of the U.S. can justifiably be proud, is that the country was transformed by five important movements to advance human rights. They were: (1) suffrage and civil rights for women; (2) civil rights for blacks and other minorities; (3) procedural rights for persons accused of crimes; (4) integrating the disabled into society as fully as they can participate; and (5) ending discrimination against homosexuals. All of these movements are works in progress and gay marriage, the crown jewel of the movement to extend equal rights to homosexuals, is still hotly debated. Extending the benefits of full participation in society to so many disparate groups in so short a time is quite an achievement. The U.S. experience is part of a general trend of Western culture and parallel developments can be seen in many places throughout the world, although perhaps not to the extent that it has been experienced in the U.S.
1. See the Quick Discussion Questions. The TWM’s Film Study Worksheet for Social Studies Classes adapted specifically for this film contains excellent discussion questions. Click here for suggested answers. 2. Art tells us that people ignore his presence because “I am so disturbing to their definition of human . . . . ” When Richard is writing his first course for employers to encourage them to employ the disabled and to show employers how it can be successfully done, Dr. Padrow tells Richard that, “You don’t have to change their minds about people with disabilities. You have to change their minds about themselves.” Why do people without obvious disabilities have difficulty interacting with those whose disabilities are obvious? Many people can’t get beyond the obvious disabilities and see the important things about a person who is physically disabled. This is because, as Art says, the obviously disabled person is disturbing to their definition of what it is to be human. However, being human is more than just being able to move your arms and legs; it’s more than even having arms and legs; it’s more than being able to see or hear; it’s more even than having the great intelligence that separates people from most animals. Another reason that the “temporarily able” may feel uncomfortable around those who are obviously disabled is that the temporarily able have a strong desire to stare at the obviously disabled person. Disabled people and their physical conditions are different and it is normal to be interested in them, but it is also considered impolite to stare. This sets up a conflict in the “temporarily able” person. The term “temporarily able” is used by some disabled people to refer to the fact that eventually, most people will become disabled in some way, due to illness, accident or just plain old age. 3. Toward the end of the film, Professor Padrow states that he had been unduly harsh with Richard when Richard auditioned for a scholarship. Dr. Padrow then tells Richard why that happened. What was the reason and describe why the incident is ironic in terms of the story of Richard’s life. Dr. Padrow suffered from bipolar personality disorder and at the tryout Richard unknowingly encountered the professor when he was in the grip of an angry and depressed mood. Chronic mental illness is a disability. The irony is that it was Dr. Padrow’s disability that helped Richard decide to enlist in the Army and go to Vietnam which started the chain of events that led Richard to his life’s work as an advocate for the disabled. 4. Do you agree with Richard’s elementary school teacher, Mr. Parks (and originally Oliver Wendell Holmes), that, “Most people go to their graves with their music still inside them”? How does that statement relate to a theme of the film? Do you know someone who has found their interior music and is living it every day? One theme of the film is that people must find their calling, the music within, and give voice to it. The story of the film is Richard finding his own music. As to the other parts of this question, there is no one correct answer. Strong answers will show thought and be supported by facts. 5. Richard didn’t want Christine to have any other man in her life. Who or what was Christine’s competition for Richard’s attention? Christine’s competition was Richard’s obsessive desire to make something of himself in an attempt to get his mother to take notice and approve of him. 6. Why do you think Richard is the only person in the student center who is sympathetic when Art is wrestling with the soda’s pop top? Because Richard also has a disability. 7. Why does Richard laugh when Art says, “This may be contagious”? Richard laughs because cerebral palsy is not contagious. It is not an infectious disease, but a condition caused by birth or prenatal trauma. However, the other people in the student center are keeping their distance from Art as if he were contagious. 8. Why does Mike drop his cigarette on Richard’s floor? Mike is angry that Richard has gotten an establishment job (with the insurance company) and seems to have forgotten about his fellow veterans. An alternative response is that Mike is jealous that Richard is making it in the outside world. 9. Both Mike and Richard suffer from anger management issues. Which of the two men is better able to deal with the frustrations of daily life? Richard is able to be successful in life because of his drive to achieve something, although he sacrifices his relationship with Christine to his desire to achieve. 1. Do you know anyone who, like Richard Pimentel, is devoted to a cause to improve society? There is no one correct response to this question. See Discussion Questions # 2. 1. How can a person who makes or inherits millions of dollars become as good a citizen as Richard Pimentel? The only way for persons of wealth to approach Pimentel in terms of citizenship is if they: (1) make their money in ways that don’t oppress other people and are ethical; (2) give large amounts of money to charity; and (3) devote a substantial amount of their time to volunteer projects. 2. Who do you admire more, a person like Richard Pimentel or your favorite movie star? There’s no contest here. For a movie star to even begin to approach someone like Pimentel in terms of citizenship, the star must give large amounts of their money away to charities and become personally involved in helping other people. 1. Students can be required to write informal essays responding to discussion questions #s 2, 3 & 4. Richard Pimentel suffers from early-life trauma. 3. Instruct students to include evidence of the causes and effects of these disorders which are outlined in the handout [or lecture] and scenes from the movie that display these causes and effects. Wikipedia Article on the “Ugly Laws”. Art Honeyman: 1940 – 2008 from OregonLive.com, published 12/9/08. This Learning Guide was inspired by Deborah Elliott and written by James Frieden. It was last revised on July 11, 2015. Many disabled people refer to able-bodied people as “the temporarily able.” What do they mean by this? Are you only temporarily able? By referring to able-bodied people as the “temporarily able” the disabled are pointing out that either by accident or illness or simply due to old age, most of us will eventually lose our abilities and become disabled. A less well-known term is “the obviously disabled.” What does that mean? Do you know someone who is disabled in some way, but whose disability is not as immediately obvious as Art’s cerebral palsy? There are many disabilities that are not immediately obvious. They include learning disabilities and mental illness. Many people who are deaf can lip read so well that others don’t know that they cannot hear. There is no one correct response. Possibilities include: accepted disabilities, silent disabilities, underground disabilities, normal disabilities. Ugly law, cerebral palsy, CP, tinnitus. During the late 1900s, many people were trying to educate the public and employers about the benefits of allowing people with disabilities to participate in mainstream American life. A major milestone in the disabilities rights movement was the passage in 1990 of the Americans with Disabilities Act (the “ADA”) which prohibits discrimination against people with disabilities in a similar manner to the Civil Rights Act of 1964 which prohibits discrimination against minorities in public accommodations. This involves for example, the installation of ramps and elevators to allow access for those in wheelchairs. A disability is defined as a “physical or mental impairment that substantially limits a major life activity.” As of 1992, all new construction of a certain size has to provide access for wheelchairs and other accommodations for the disabled, such as grab bars in toilets. Actor Michael Sheen, playing Art, gives a stellar and engaging performance. The movie works because young audiences love his character. The performances of the other actors in this film are good — some are very good — but Sheen’s portrayal is amazing. Viewers have difficulty believing that in real life he does not suffer from cerebral palsy.